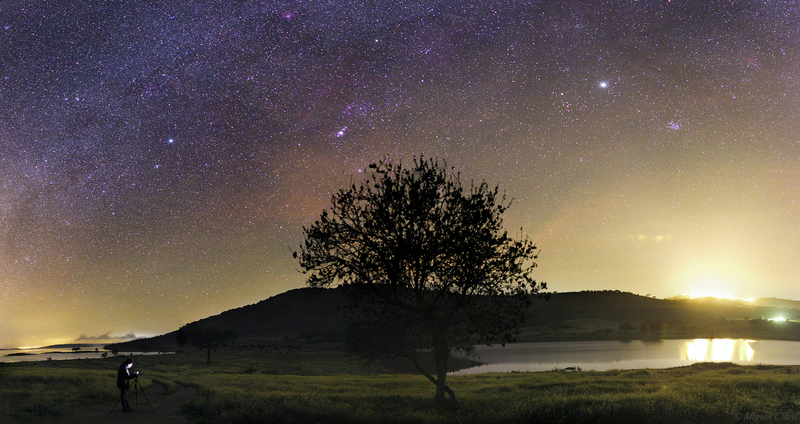 The image reveals a panoramic scene of a Spring Milky Way rising in the morning twilight, above Castro de Palheiros, or Fragada of Castro. 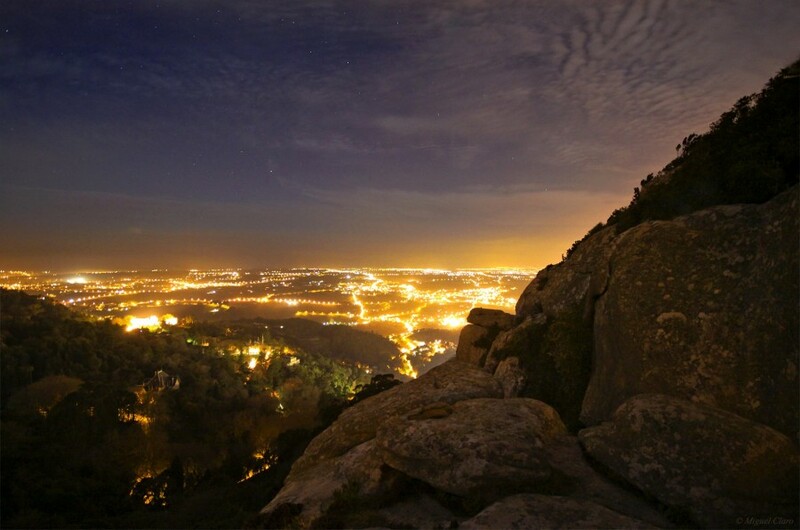 Located in the Natural Park of Tua Valley, near Mirandela, “is an imposing quartzite ridge that was being carved and built by the people of Murça region, between the beginning of the third millennium BC up to the present”, according to the Interpretative Center of this region. In the background, Vega star from Lyra constellation is visible in the left side of the image, above Cygnus constellation, while in the opposite direction, the supergiant star Antares, from Scorpius constelllation, is shinning in orange. 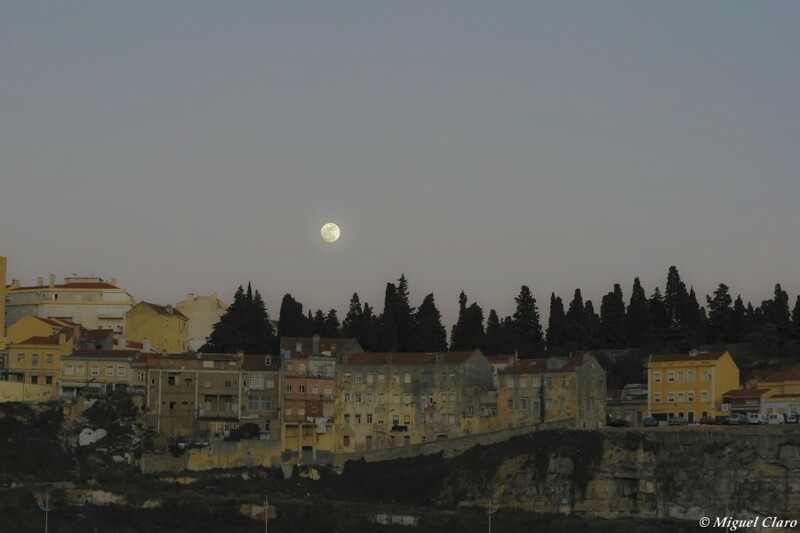 PT: A imagem revela uma cena panorâmica de uma Via Láctea primaveril a nascer ao crepúsculo matinal, acima de Castro de Palheiros ou Fragada de Castro. Localizada no Parque Natural do Vale do Tua, perto de Mirandela, “é uma imponente crista quartzítica que foi sendo esculpida e construída pelas populações da região de Murça, entre o início do terceiro milénio antes de Cristo até ao presente, segundo o Centro Interpretativo da região. Em pano de fundo, a estrela Vega da constelação Lyra é visível no lado esquerdo da imagem, acima da constelação do Cisne, enquanto na direção oposta, a estrela supergigante Antares, da constelação do Escorpião, brilha numa tonalidade alaranjada. 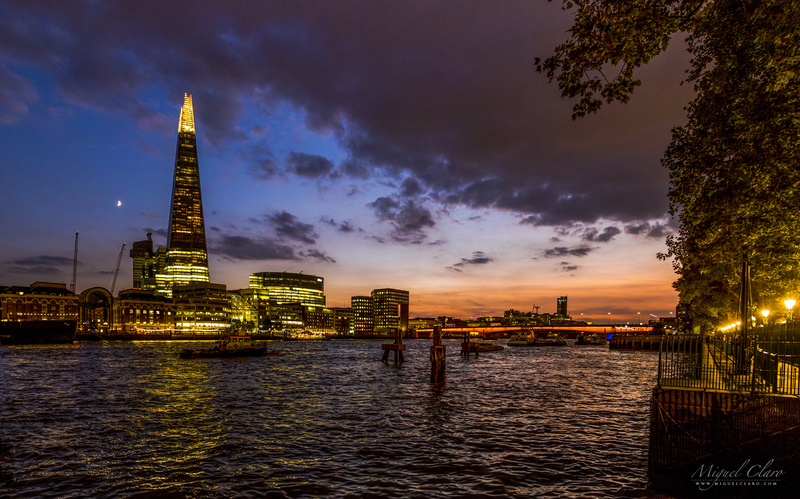 A panorama captured with a Nikon D810a | 26mm at f/2,8 | ISO4000 | Exp. 15 secs. Captured from inside of Ramon Crater or “Makhtesh Ramon” in Israel’s Negev Desert, is the world’s largest “erosion cirque” – a landform which are only found in the Negev and its extension into Egypt’s Sinai desert created 220 million years ago when oceans covered the area. 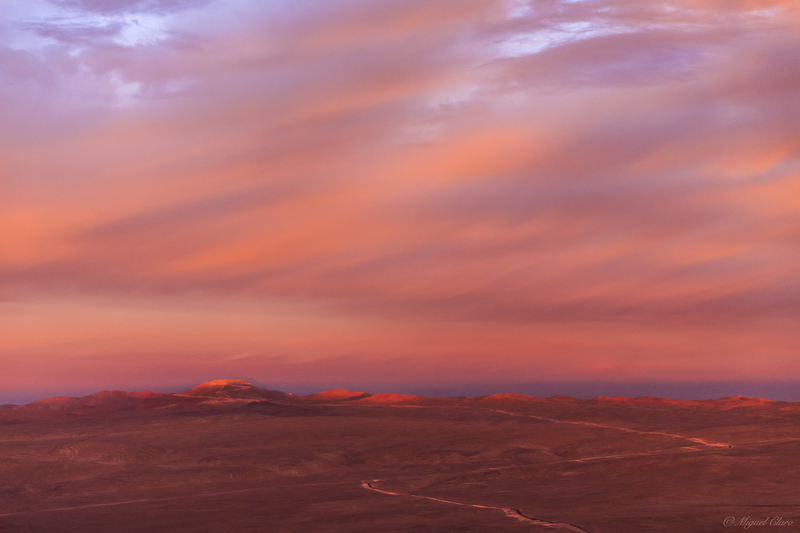 Located in the southern of Israel, Negev is a rocky desert with clay hills known for their fantastic red and yellowish colors, and cover more than half of the country. Nomadic life in the Negev dates back at least 4,000 years, and perhaps as much as 7,000 years according to some books, featuring a number of small Bedouin cities. 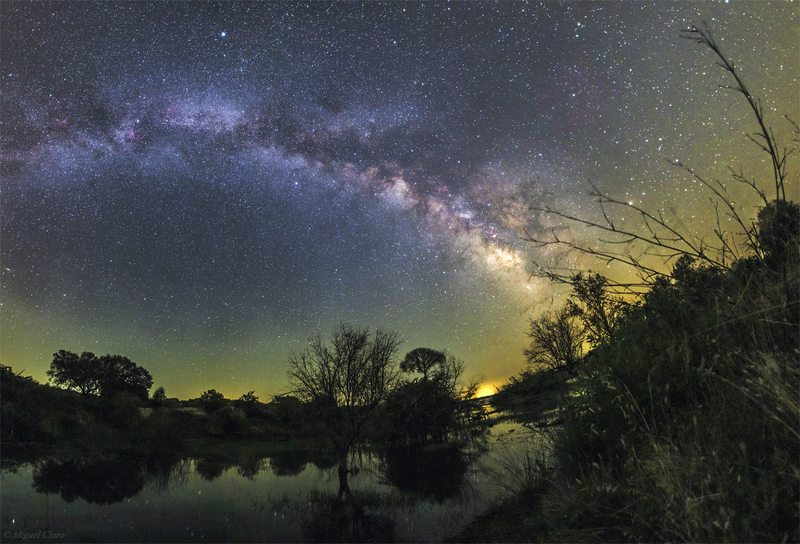 The image is featuring an arched path of faint light from the winter Milky Way full of deep sky objects visible as a diffuse red/violet colors. At left we can find Sirius, the brightest star in the entire celestial sphere, and next to it, Orion constellation, with the reddish emission coming from Orion Nebula. Above, we can also find Rosette Nebula. 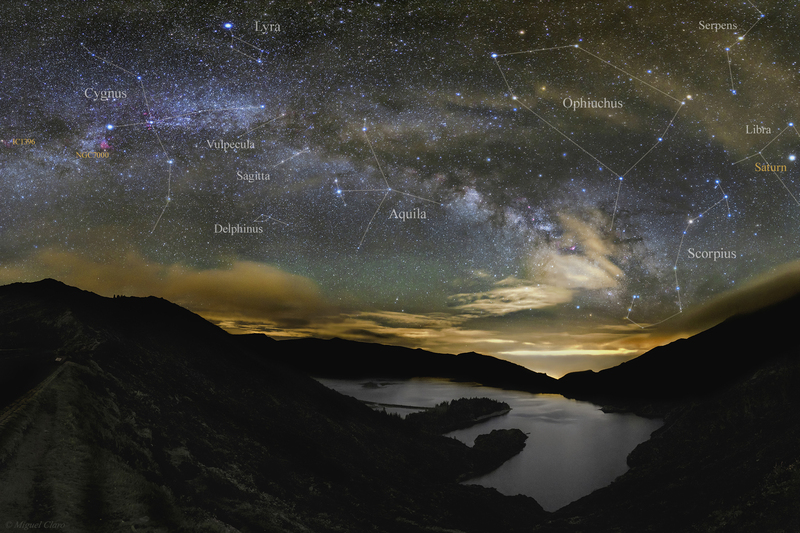 In the top right Auriga constellation and Taurus are visible, while the Pleiades, a small group of bright blueish stars, also known as the seven sisters, are set behind the horizon. 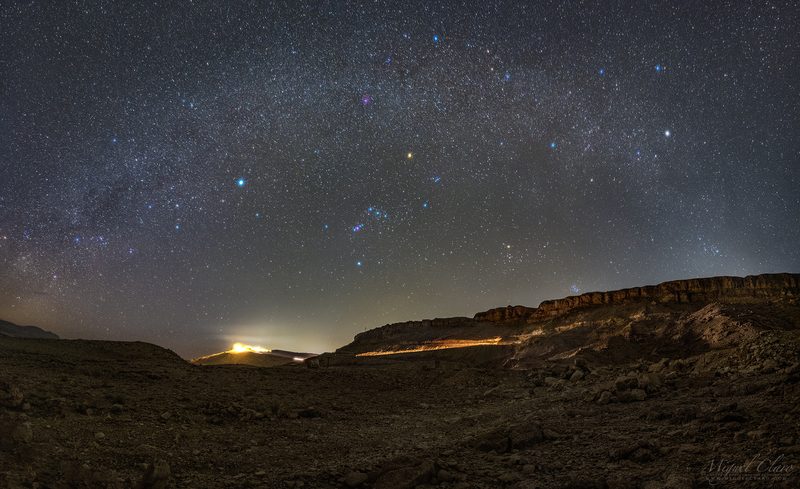 The light pollution seen above the horizon is coming from Mitzpe Ramon. PT: Captada a partir da Cratera Ramon ou “Makhtesh Ramon” no Deserto de Negev, é o maior “cirque de erosão” do mundo – uma forma que só é encontrada no Negev e na sua extensão até ao deserto do Sinai, no Egipto – criado há 220 milhões de anos atrás. Localizado no sul de Israel, o Negev é um deserto rochoso com colinas de argila conhecidas por suas fantásticas cores vermelhas e amareladas, e cobre mais da metade do país. A vida nómade no Negev remonta pelo menos a 4.000 anos atrás, e talvez até 7.000 anos, de acordo com alguns livros, apresentando uma série de pequenas cidades beduínas. A imagem mostra um caminho arqueado de luz fraca da Via Láctea de Inverno, cheia de objetos do céu profundo, visíveis como uma cor vermelha a violeta difusa. 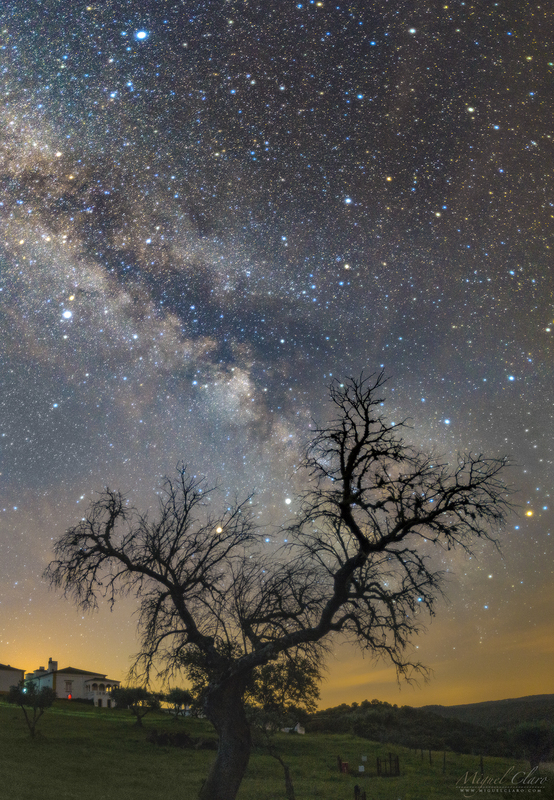 À esquerda, podemos encontrar Sirius, a estrela mais brilhante em toda a esfera celeste, e ao lado dela, a constelação de Orion, com a emissão avermelhada vinda da Nebulosa de Orion. 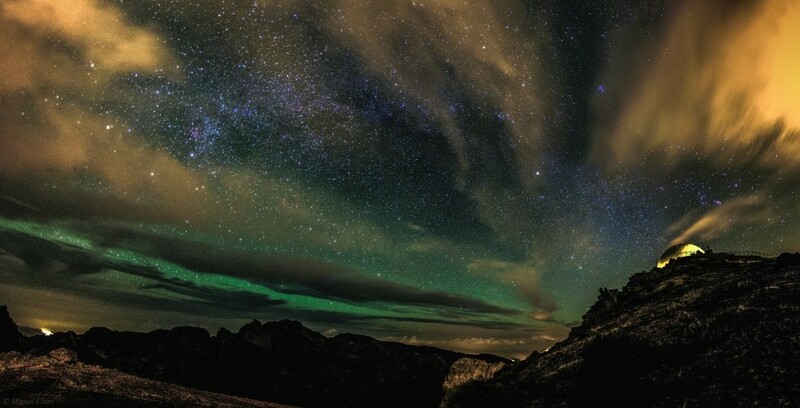 Acima, também podemos encontrar a Nebulosa Roseta. 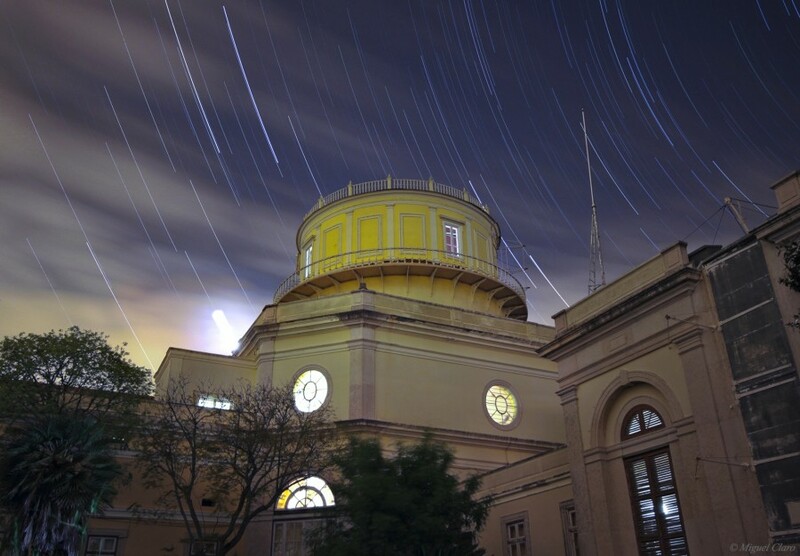 No canto superior direito, a constelação de Auriga e Touro são visíveis, enquanto as Pleiades, um pequeno grupo de estrelas azuladas brilhantes, também conhecidas como as sete irmãs, se deitam por detrás do horizonte. A poluição luminosa visível acima do horizonte, provém de Mitzpe Ramon. 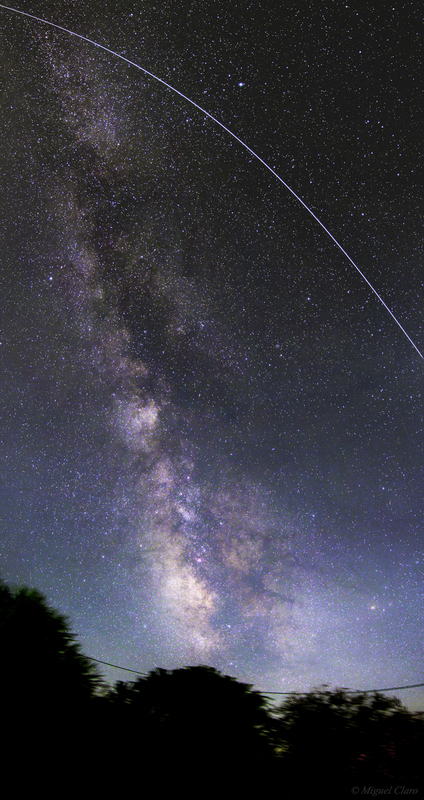 A mosaic of 6 single frames with a Nikon D810a | 21mm at f/2,8 | ISO2500 | Exp. 25 secs. 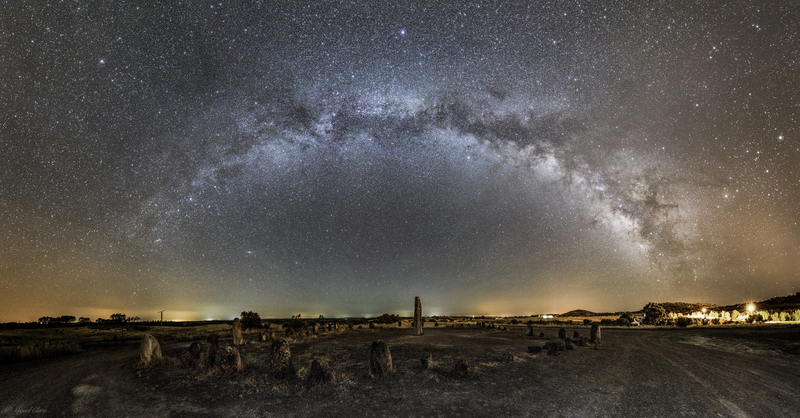 A panoramic view from Mértola, Dark Sky® Alqueva, shows a celestial scene captured in a night where the presence of a reddish-yellow airglow was very active. 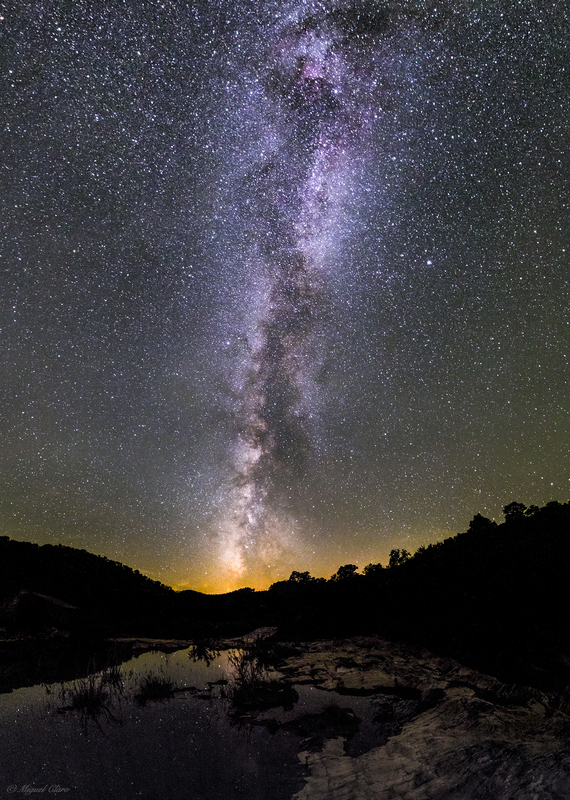 In the background, the well know asterism from Big Dipper or Ursa Major, is shinning at the left edge, while in the opposite direction of the image a faint light from the Milky Way is visible behind the layer of airglow. Sirius, the brightest star in the entire celestial sphere is well spotted and above it – in the right top corner – the H-alfa emission coming from Rosette and Orion Nebula are noticeable in red, with Lambda Orionis, Barnard´s Loop, Horse Head and M42 well visible. Below, a partial path of Guadiana river is reflecting the color of the sky. 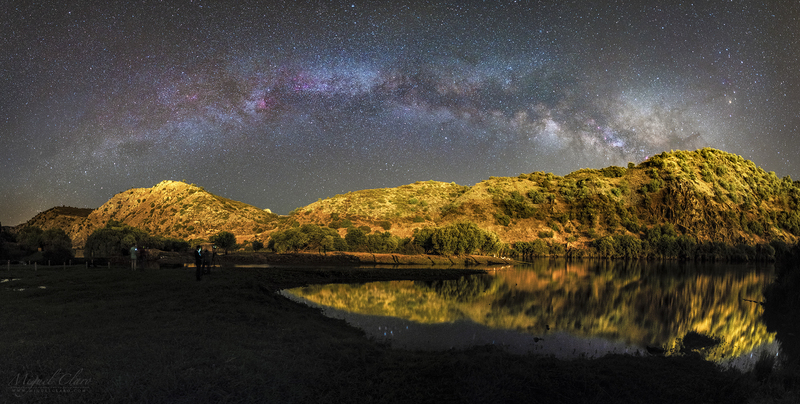 PT: Uma vista panorâmica de Mértola, Dark Sky® Alqueva, revela-nos uma cena celestial captada numa noite em que a presença de “airglow” amarelo-avermelhado, também conhecido por luminescência foto-química da atmosfera, se encontrava bastante ativo. 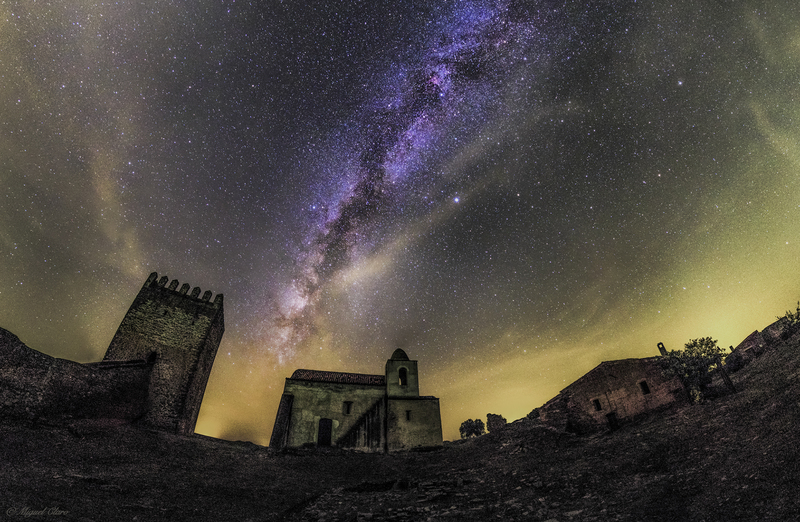 Em pano de fundo, o conhecido asterismo da Ursa Maior brilha no extremo esquerdo da imagem, enquanto na direção oposta, uma leve luz da Via Láctea é visível por detrás da camada de airglow. Sirius, a estrela mais brilhante em toda a esfera celeste, é bem visível próximo da Via Láctea e logo acima dela – no canto superior direito – a emissão H-alfa proveniente da Nebulosa da Roseta e Orion, podem ser perceptíveis numa tonalidade avermelhada. 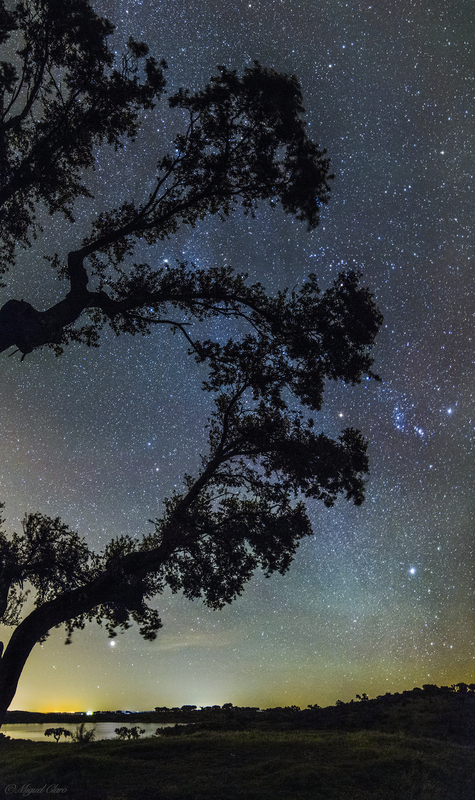 Em Orion, são ainda visíveis objectos de céu profundo como Lambda Orionis, Barnard´s Loop, Horse Head e M42. Abaixo, um caminho parcial do rio Guadiana está refletindo a cor do céu. 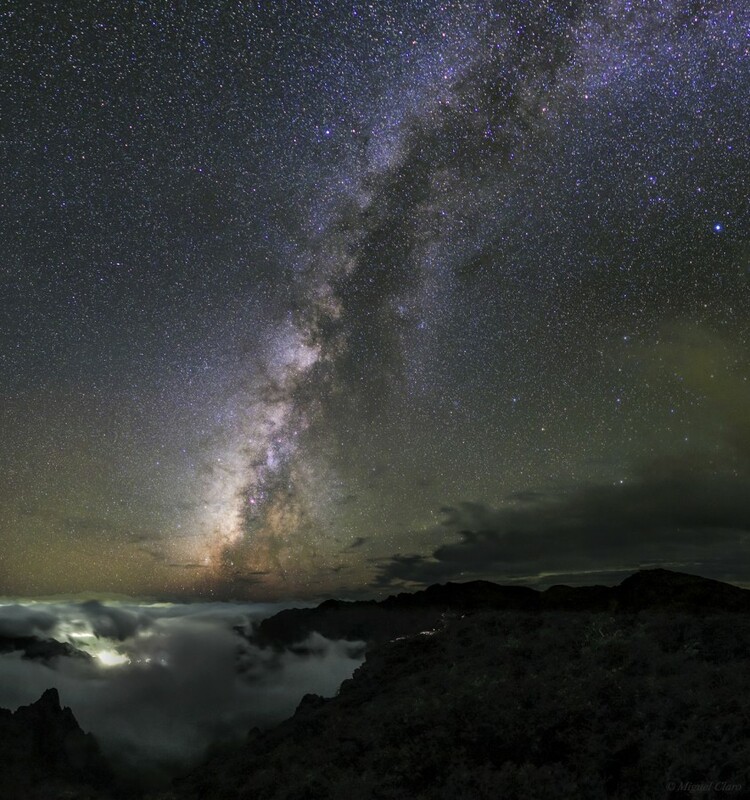 A panoramic view with the mountain of Roque de Los Muchachos, in La Palma Canary island, where stands a huge complex with 15 telescopes, some of the largest telescopes in the world from 19 nations working near the coast of Africa, in Atlantic Ocean. 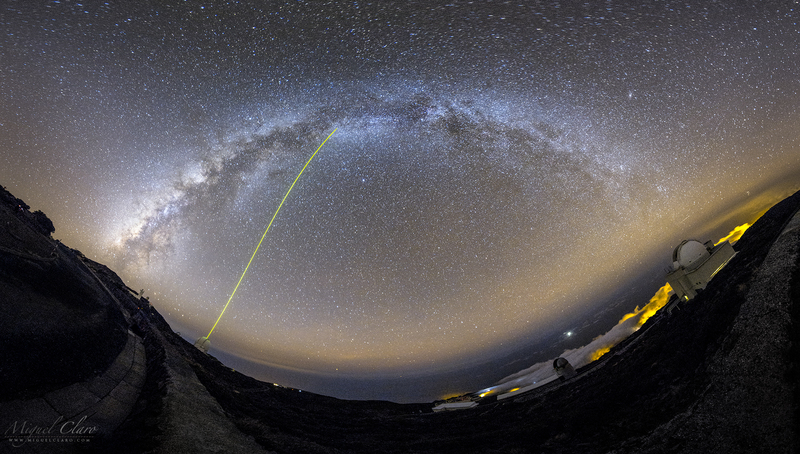 At left edge, the Zodiacal Light touch the Milky Way that start its arched shape near the William Herschel Telescope (WHT) with the laser pointed to the Zenith, while in the opposite direction, the faintest part of Milky Way arm sets behind the open dome of Isaac Newton Telescope (INT). 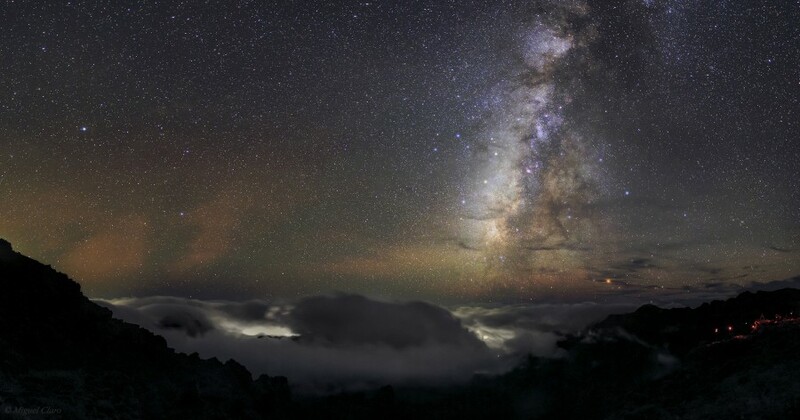 PT: Vista panorâmica da montanha de Roque de Los Muchachos, em La Palma, nas Ilhas Canárias, onde se encontra um dos maiores observatórios do mundo, um complexo de 15 telescópios de 19 nações que opera perto da costa da África, Oceano Atlântico. Na extremidade esquerda, a subtileza da Luz Zodiacal toca a Via Láctea que começa a sua forma arqueada perto do Telescópio William Herschel (WHT) que tem o laser apontado em direcção ao Zénite, enquanto na direção oposta, é possível ver a outra extremidade do arco galáctico, representado pela parte mais ténue da Via Láctea que se vai ocultando atrás da cúpula do Telescópio Isaac Newton (INT), visível à direita. In the left side of the sky we can see the trail of Sirius star. Moving to the right in the center of the image, is located the Canopus startrail, as well the draged motion of Large and Small Magellanic Clouds. 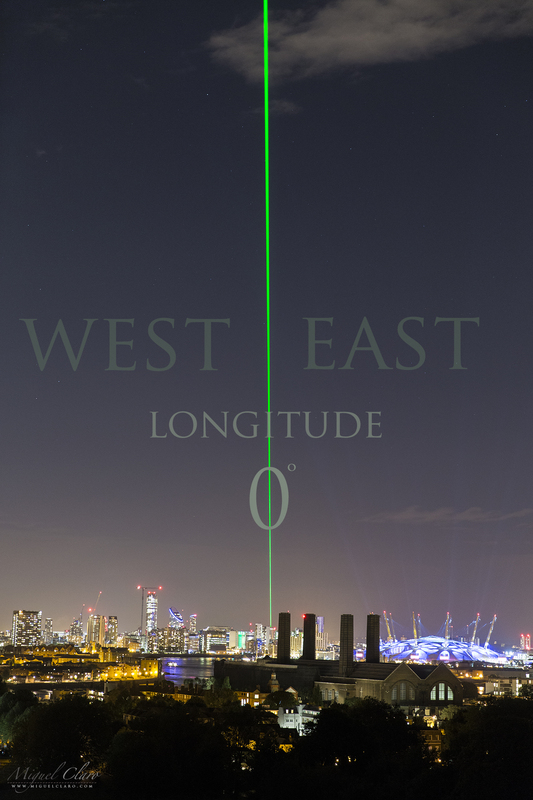 Below them, the rotational motion of Earth helped to find with precision the right position of the South Pole in the sky. In the ground, we can see the white dome of Residencia where astronomers from ESO working daily on VLT complex, are hosted. 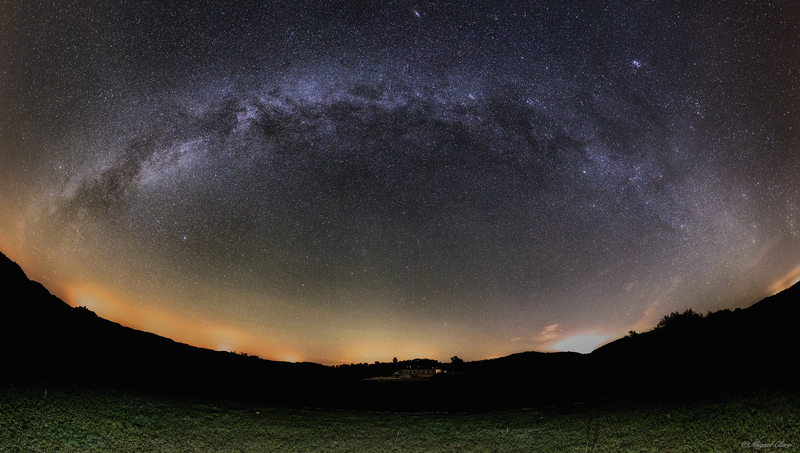 In the left side of this – almost 360º- panoramic view, we can see Canopus star and the Large (LMC) and Small (SMC) Magellanic Clouds. 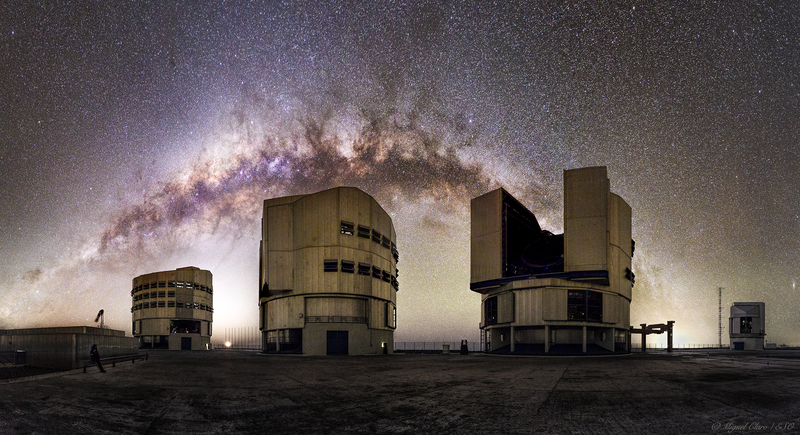 Above the horizon, in the beginning of Milky Way arc, are yet visible the bright stars Alpha and Beta Centauri. 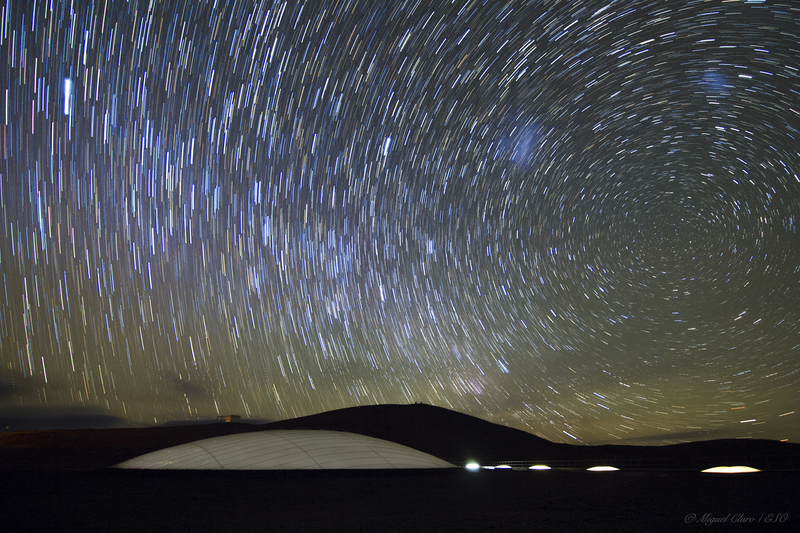 At the center, lie down the galactic arm with the Zodiacal Light as a background of Antu telescope. 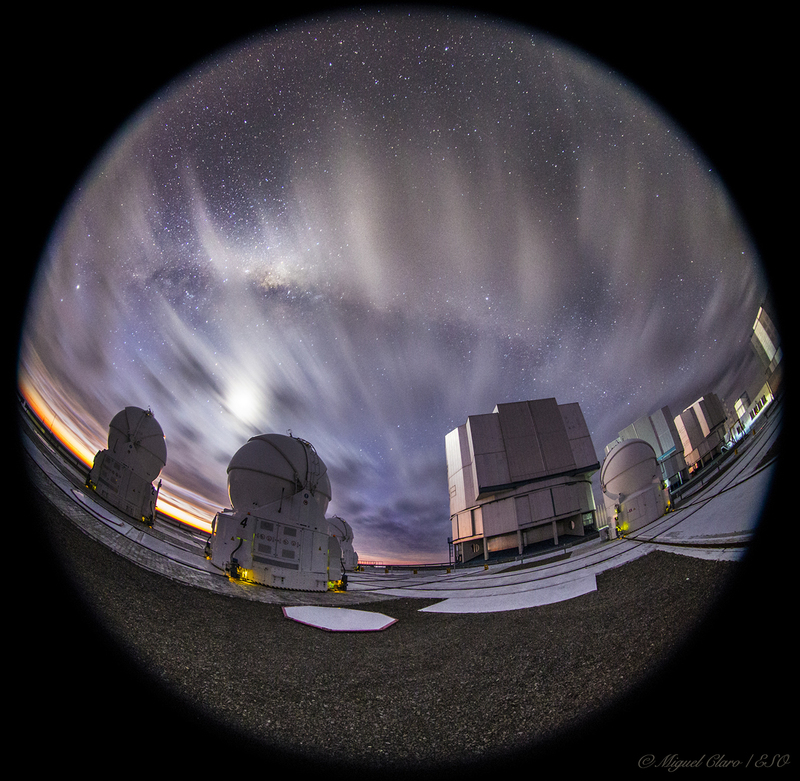 Next to the last telescope is clearly visible the elongated diffuse light coming from Andromeda galaxy. 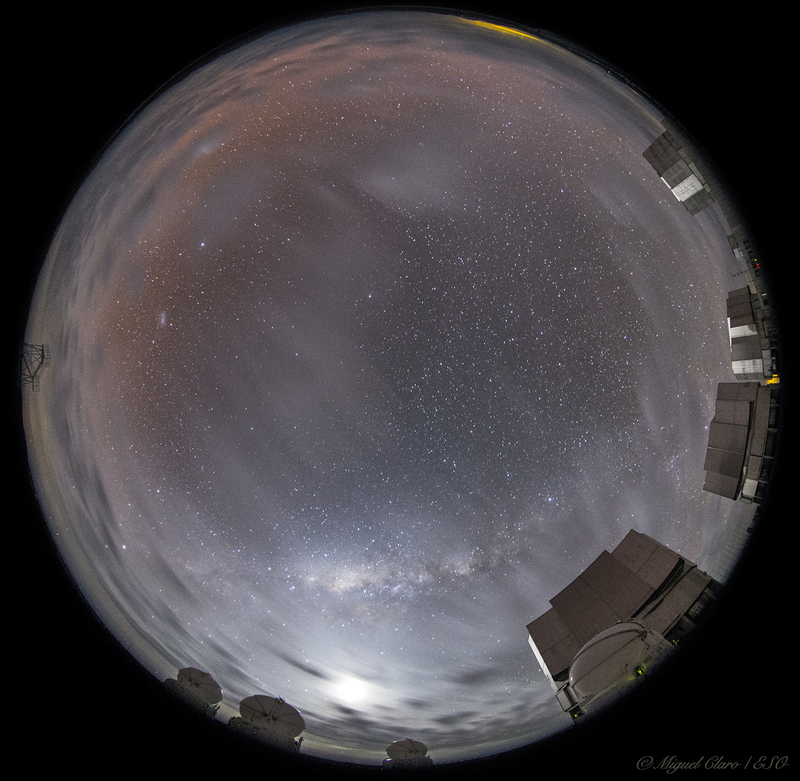 In the upper part of the image and opposite direction of Magellanic Clouds, is shining a Gegenschein, that is a faint brightening of the night sky in the region of the antisolar point. 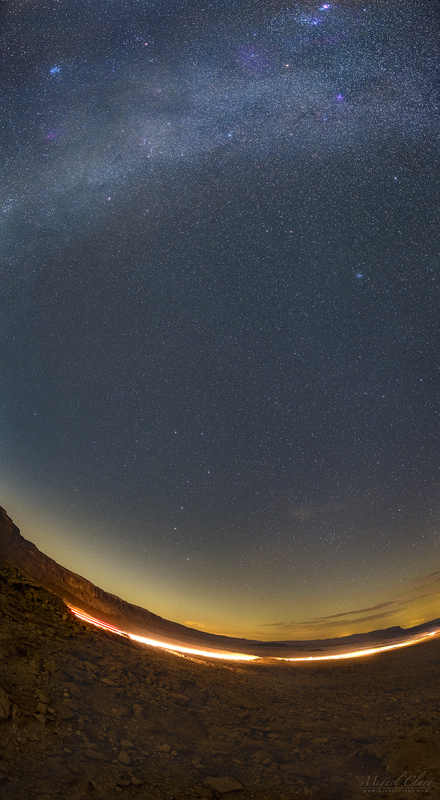 Like the zodiacal light, the Gegenschein is sunlight scattered by interplanetary dust. Most of this dust is orbiting the Sun in about the ecliptic plane. 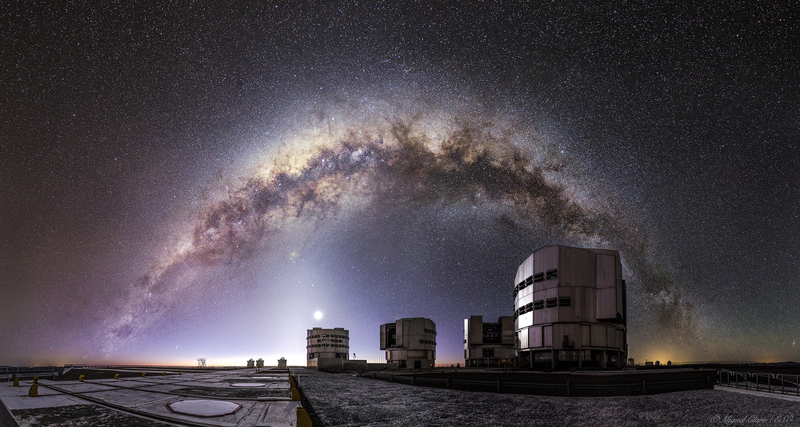 It is distinguished from zodiacal light by its high angle of reflection of the incident sunlight on the dust particles. 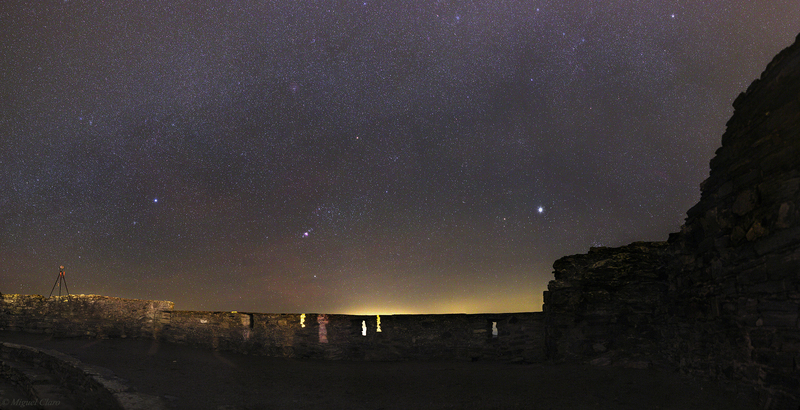 Below right and near the horizon, the Pleiades (M45) star cluster is visible next the tower silhouette. 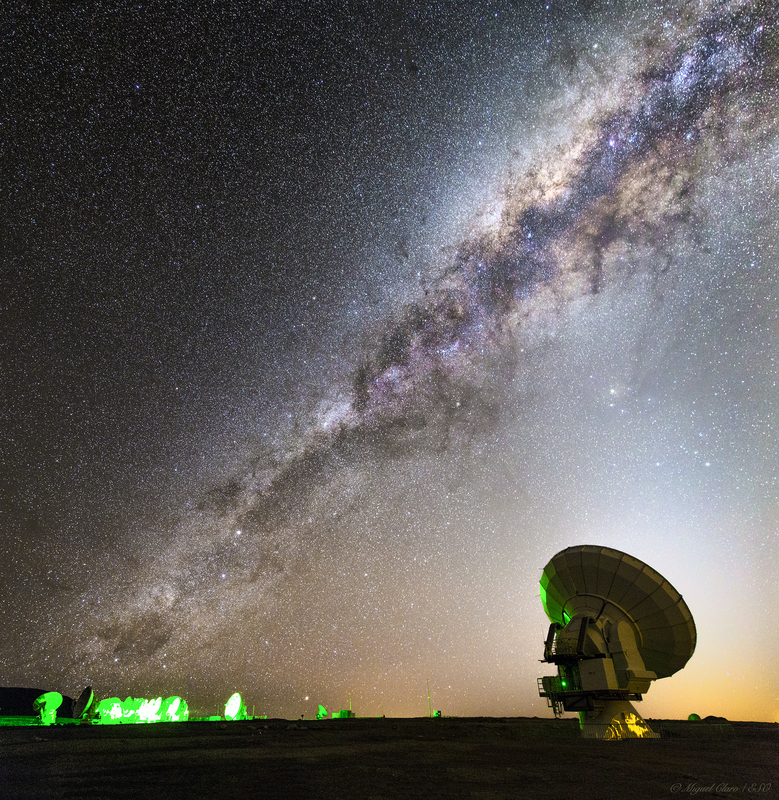 Milky Way arc of gas and dust lying behind the Yepun (UT4) VLT Telescope, in the foreground, while it is capturing the light coming from deep space. Below left we can see the bright light of the moon and above it, the planet Saturn. 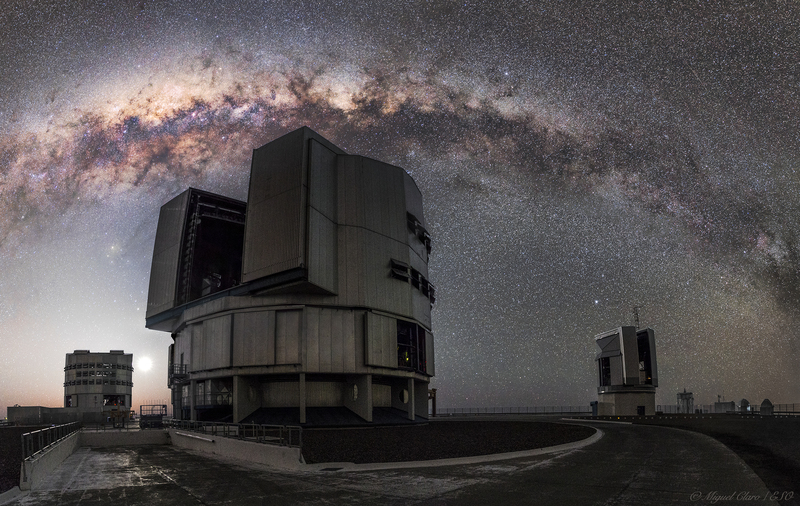 At the right edge of the image, we can see the VLT Survey Telescope (VST), that is the latest telescope to be added to ESO’s Paranal Observatory in the Atacama Desert of northern Chile. 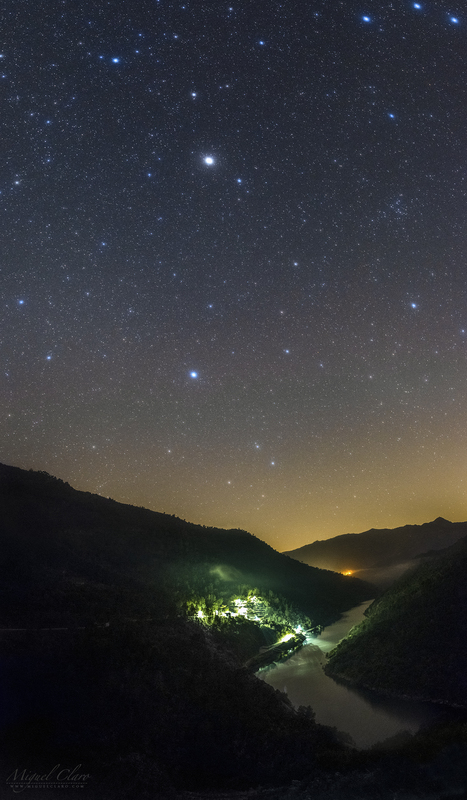 Above the VST is shinning the bright star Vega, forming in the upper right area, the well known asterism as The Summer Triangle. 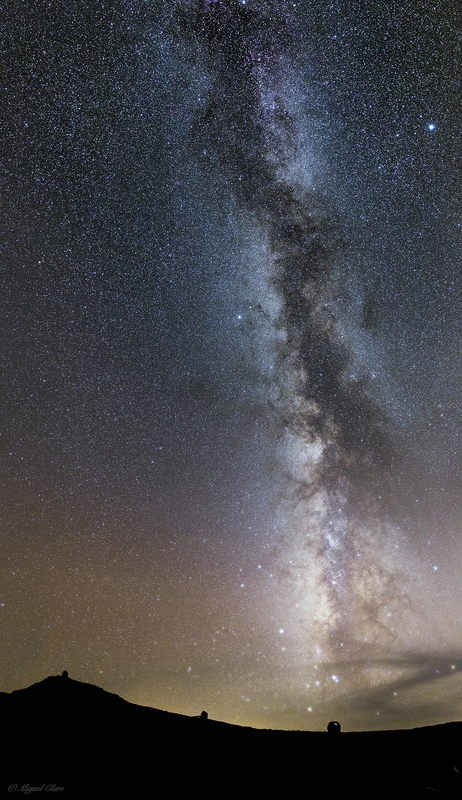 In this close-up of the central region of the Milky Way full of gas and dust, star clusters and emission nebulae, lies as the perfect background to framing the right alignment (from left to right) between the VLT telescopes Antu (UT1), Kueyen (UT2) and Melipal (UT3). In Mapuche language, Antu means “The Sun”, Kueyen “The Moon” and Melipal “The Southern Cross”. 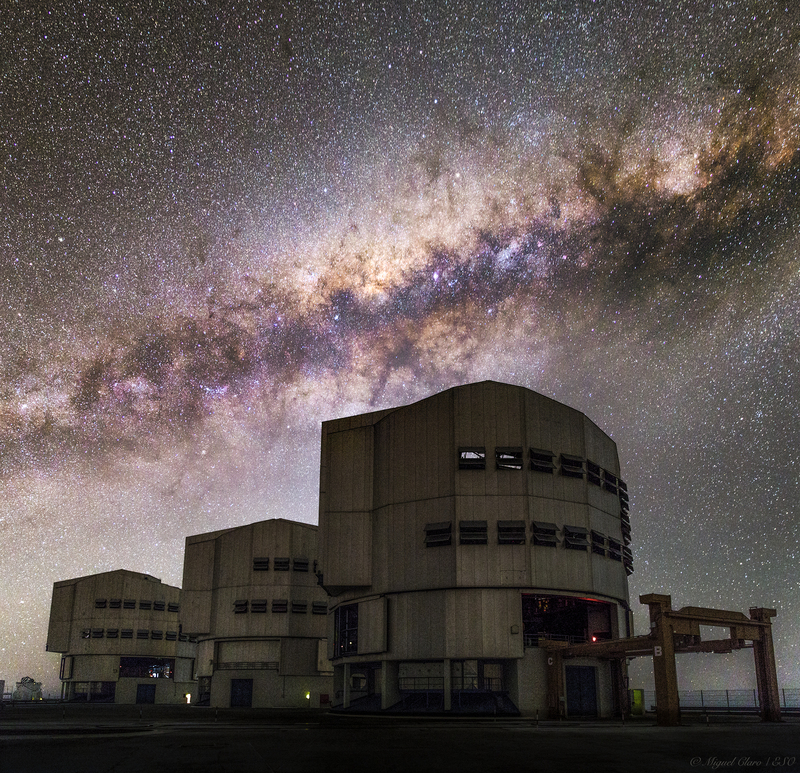 Vertical vision of our great Milky Way above the GTC – Gran TeCan Canarias Telescope in observatory Roque de Los Muchachos. 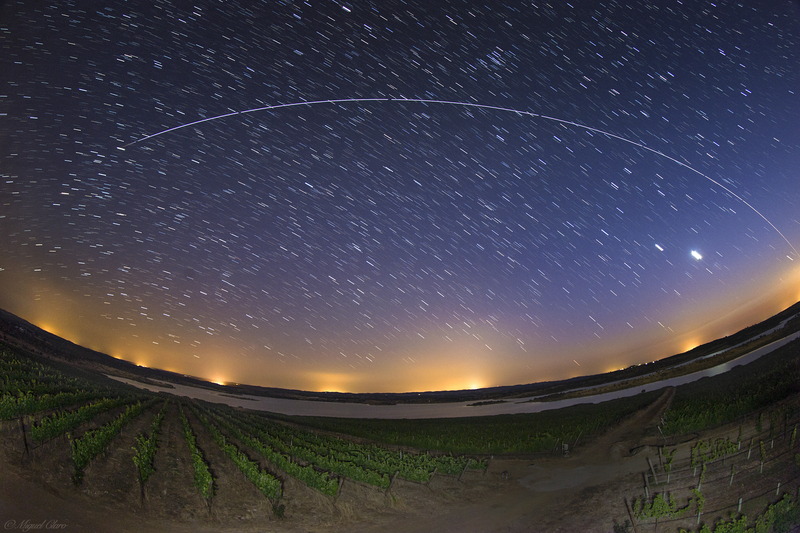 ISS crossing the arm of Milky Way reaching a magnitude of -3.2 above the land of Vila Boim, in Alentejo. In the top of the image, the path of International Space Station is transiting between the stars that forming the well known Summer Triangle, in that moment as seen from Earth, the ISS was reaching the Zenith, the point above our heads, the moment when it is also more close to us..
Canon 60Da – ISO 200, Exp.208 Secs at f/4 with a 11mm lens and a Vixen Polarie travel mount. 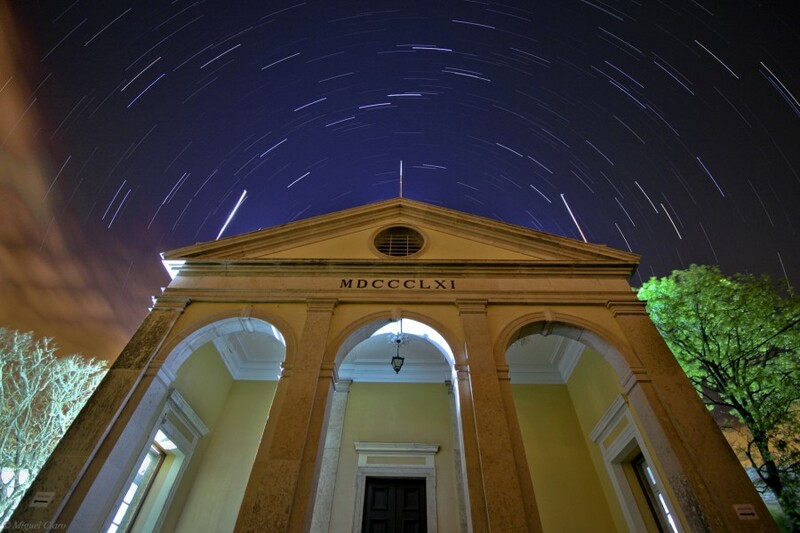 Taken in 02-08-2014 at 22h30, during an exposure of consecutive 3.4 minutes. 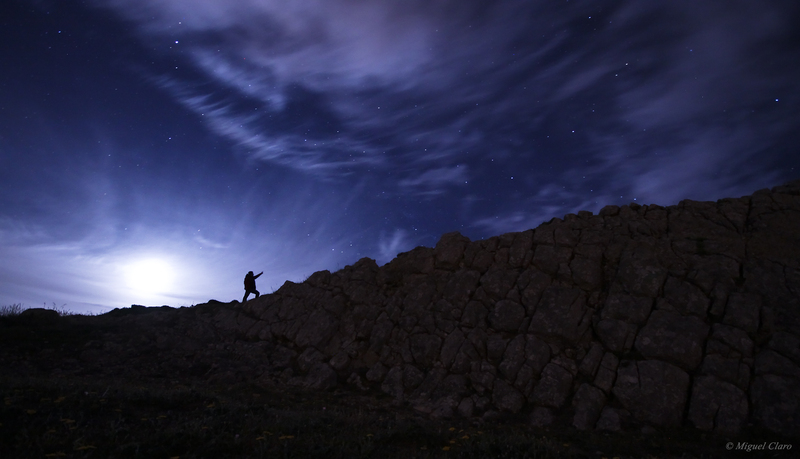 This amazing view of the Atlantic Ocean against the Rocky cliffs from Cabo Espichel, was only possible to be photographed during the night, due, to the strong light of the Moon that was almost full and could Light up all the dramatic and beatiful scene. In the sky, during two hours I could register the path of the brightest star in the celestial sphere ( Sirius), that is visible in the middle of image. 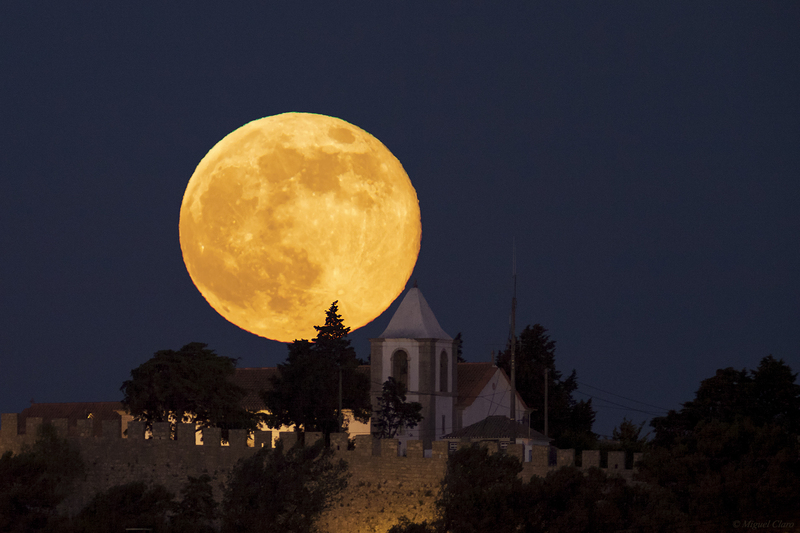 The light of the moon like a trick of magic turned the night in day, with the sky staying blue. 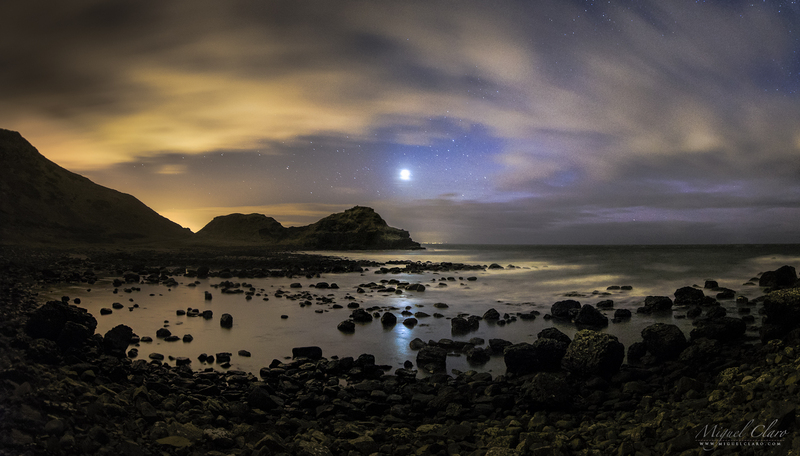 The white clouds near the horizon gave the last fine touch, in this quite and peaceful scene. 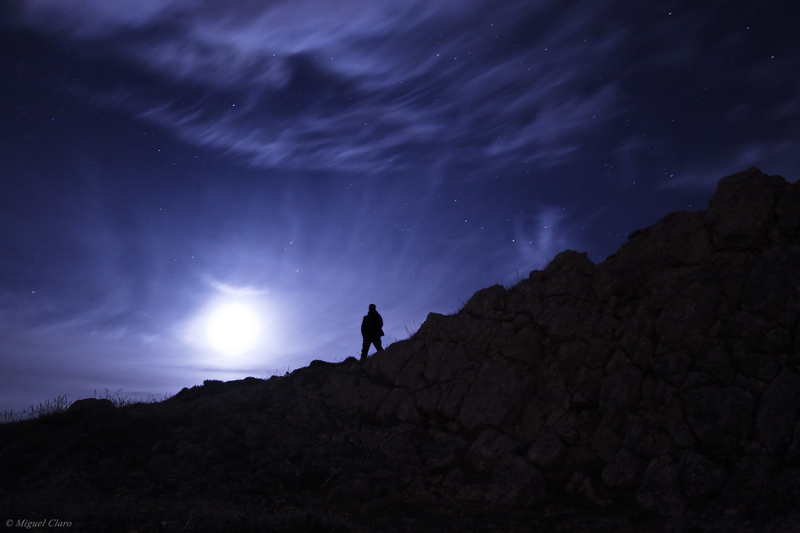 Canon 50D- ISO640 f/5 Exp. 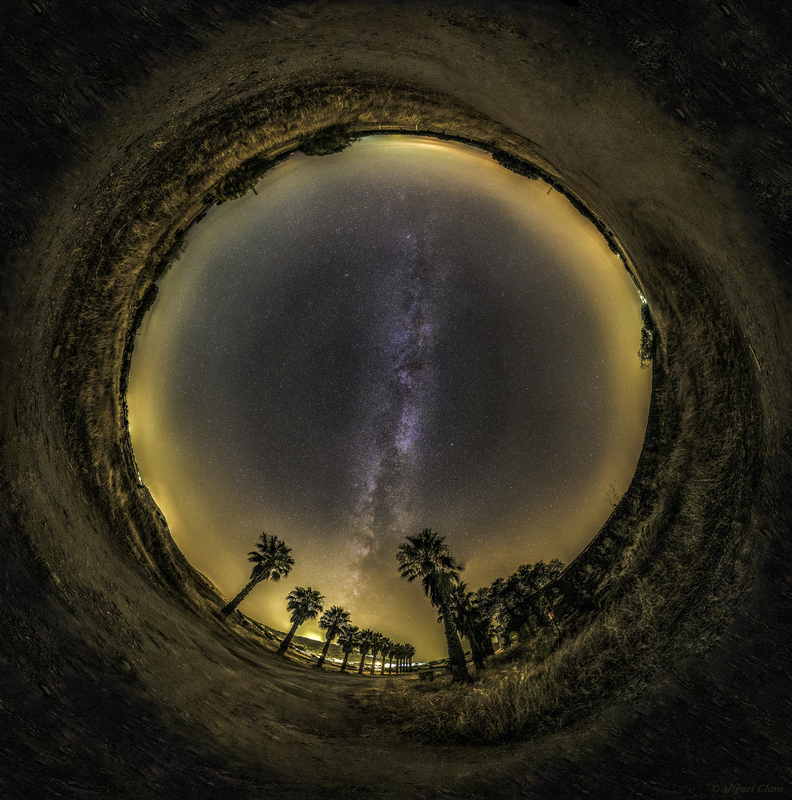 20″ 10mm lens in 07/01/2012 between 22:56 and 00:59. Sum of 339 images. 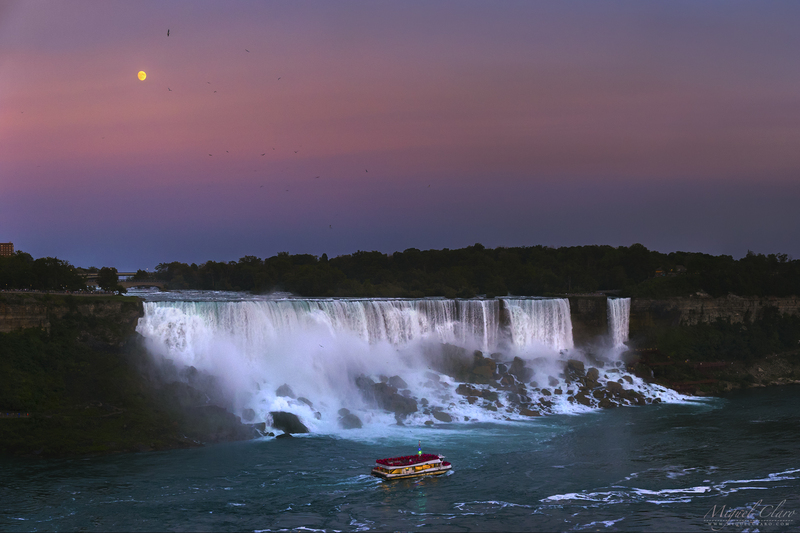 Above- Panoramic image composed by 5 vertical photos. 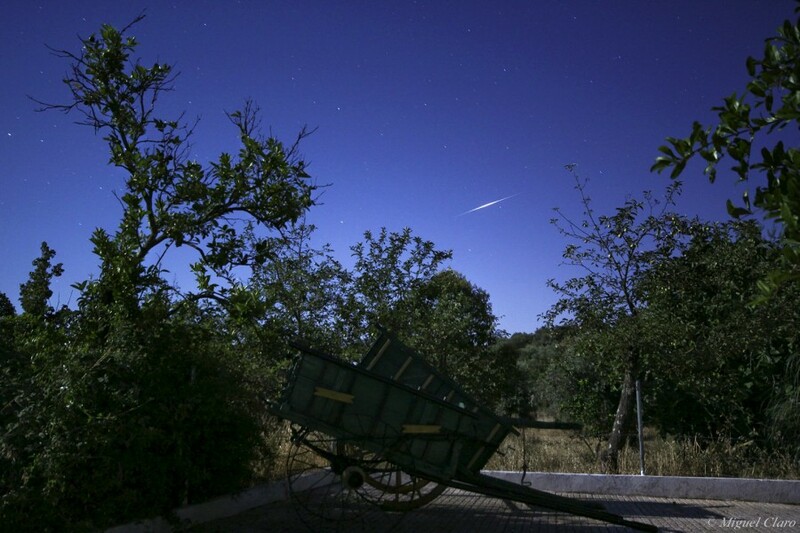 Imagem de dois Iridum Flares o 58 e 95, captados em Vila Boim, no Alentejo. 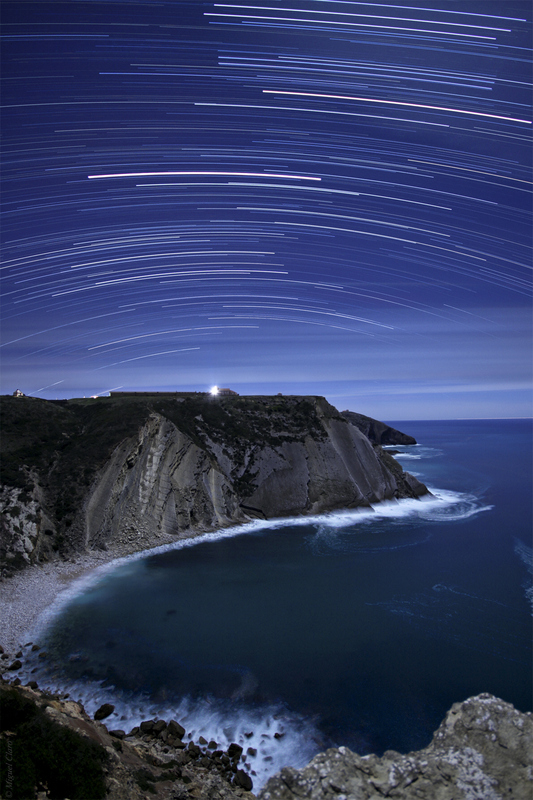 Iridium Flare – Reflexo das Antenas dos satélites artificias. 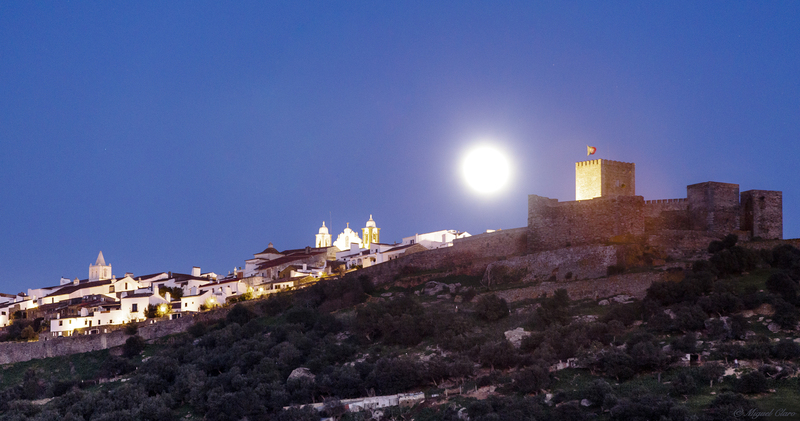 Imagem da Via láctea obtida em Vila Boim, Elvas, Alentejo. 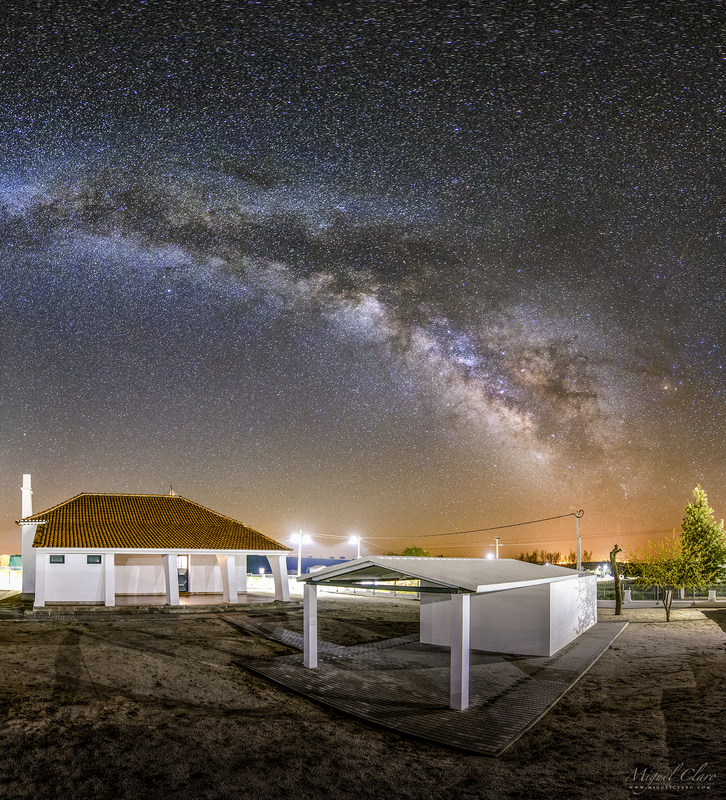 Panorama composto por 4 single images. 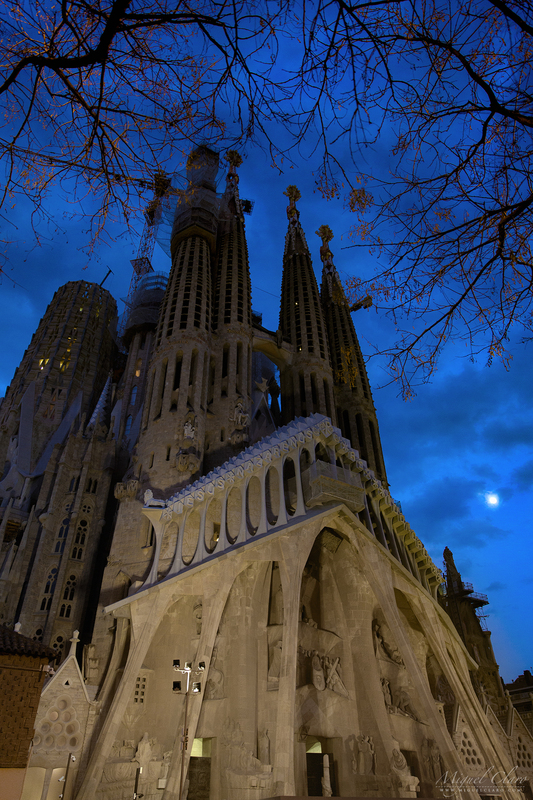 Canon 50D – ISO500 F-5.6 Exp.-4″ 20mm. Imagem do movimento da Lua registado ao longo da noite no dia 17 de Fevereiro de 2010, entre as 20h29 e as 21h30. Para o resultado final foi feita uma soma manual de 111 imagens no CS3 cada uma de 30 segundos, totalizando uma integração de 60 minutos, com uma Canon 50D a uma abertura F-5 a ISO 125, com uma Lente Sigma HSM EX a 15mm. 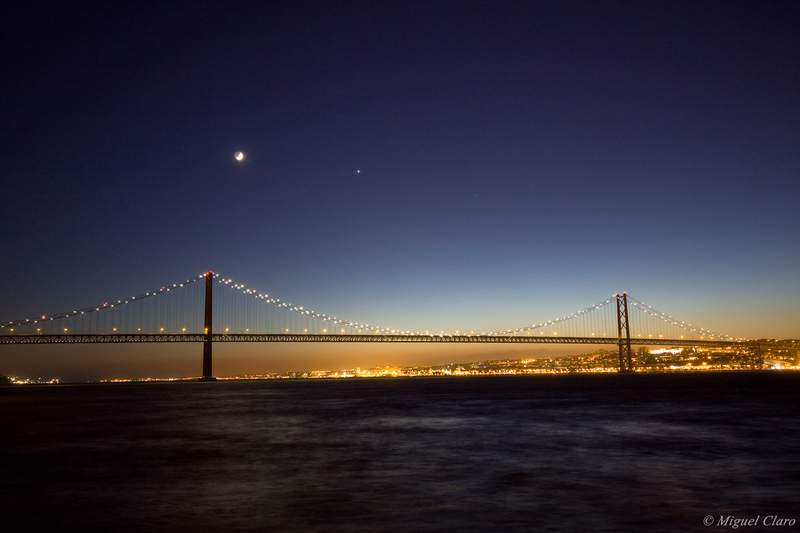 Imagem obtida em Almada, junto ao Rio Tejo. São visíveis vários rastos de aviões que se movimentam em direcção ao aeroporto de Lisboa, assim como o rasto da Lua Crescente e de algumas estrelas da constelação de Andromeda, Pegasus e Carneiro. 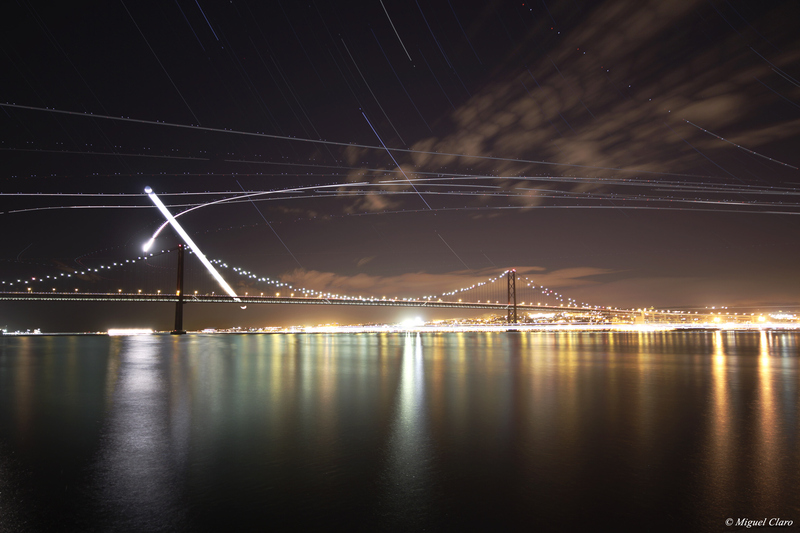 Junto ao horizonte lisboeta é ainda visível o rasto luminoso de um navio que se movimenta em direcção ao Oceano Atlântico. 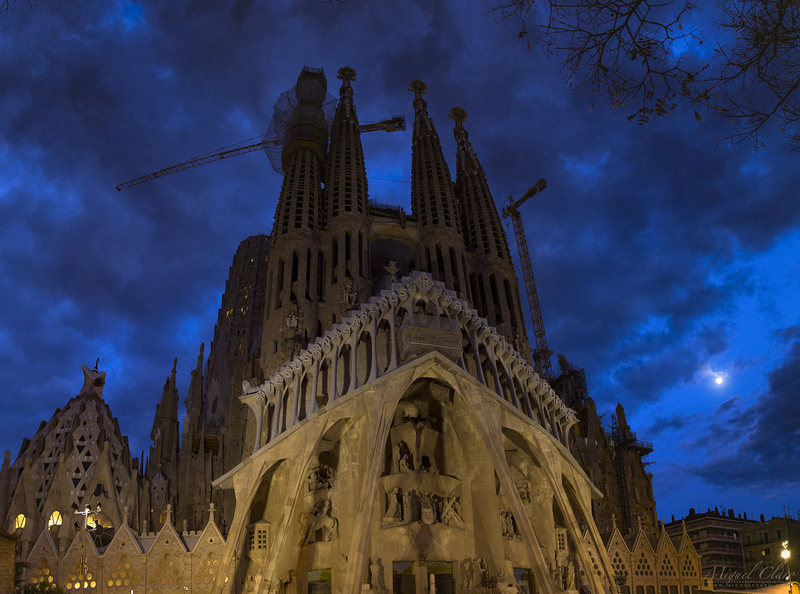 Image published in National Geographic, click here.